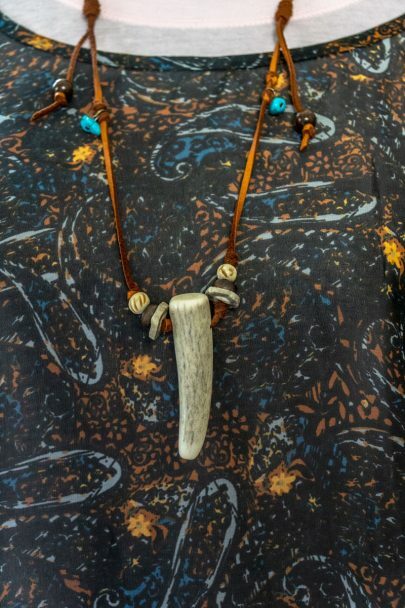 This Mystic Antler deer antler tip pendant features a 2 1/4 inch hand cut and polished deer antler tip securely attached on an adjustable (13 1/2 – 22 inches in-length) leather cord and is embellished with engraved wooden beads, faux turquoise stones, and two handcrafted deer antler button beads. Q. What makes a Mystic Antler Jewelry piece so special? A. Each Mystic Antler Jewelry piece is individually handmade and handcrafted by one of our artisans, so you’ll be getting a unique one of a kind jewelry item. There will be no two exactly the same. Once, the jewelry item has been finished, and then looked over closely by one of our master craftsmen to ensure only the best quality. The necklace is fully adjustable in size. Comfortably fits most neck sizes. Antler tip pendant has a hole drilled through it to securely attached to a brown leather cord. Made with 100% naturally shed deer antler. Every antler tip pendant is cut and polished to perfection by hand. 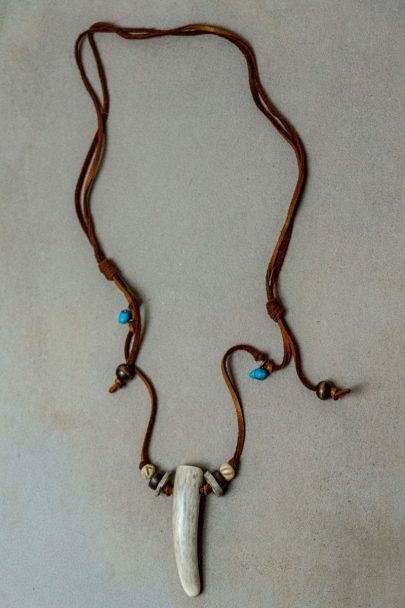 Each antler tip hangs securely from an affixed leather cord. Antler tip pendant measures approximately 2 1/4″ long. PLEASE NOTE: THE NECKLACE YOU SEE PICTURED IS THE ITEM YOU’LL RECEIVE WHEN PLACING YOUR ORDER. BECAUSE EACH MYSTIC ANTLER JEWELRY PIECE IS INDIVIDUALLY HANDMADE, YOU’LL BE GETTING A UNIQUE ONE OF A KIND JEWELRY ITEM. THERE WILL BE NO TWO EXACTLY THE SAME.